Silicone material for HOT PIPES, CHIMNEY PIPES, CHEMICAL PIPES, EXTREME ENVIRONMENTS AND SERVICE AREAS. Provides a permanent seal that controls gaseous or liquid environments to eliminate leakage and odor contamination. Made of heavy-duty aluminum alloy for flexibility and corrosion resistance. 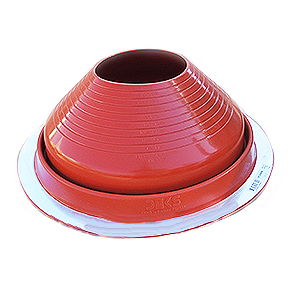 The stepped-cone design makes Master Flash easily adaptable to most roof pitches. SELECT and TRIM... Choose appropriate size opening at least 20% smaller than pipe diameter. If necessary trim opening to 20% smaller than pipe diameter. SLIDE... Slide down over pipe. (A non-petroleum base lubricant will ease installation.). Use RETRO-FIT Flashing where pipe is not accessible. FORM... Press down, bending it to conform to roof profile or roof irregularities. A blunt tool will help press flashing into tight roof angles. SEAL... Apply a bead of sealant between flashing base and roof and at top edge to pipe. FASTEN... Use exterior grade fasteners with sealing washers to complete sealing. For UPC installation, fastener spacing may not exceed 1-1/2" (38mm).